Create and email professional invoices with PayPal to get paid faster. Your customers can pay you quickly and easily with their Mastercard, Visa or American Express card, or their PayPal account. Enter your business information and customer, job and cost details in our simple online form. Preview your invoice then send it. Save the invoice template for faster invoicing next time. Keep track of your invoices in your PayPal account. We’ll email you when each one is paid. Email an invoice with PayPal to customers around the world quickly and they can pay you in minutes. It’s more secure, convenient and fast for both you and your customers. It’s free to send an invoice; you only pay when your customer pays it. 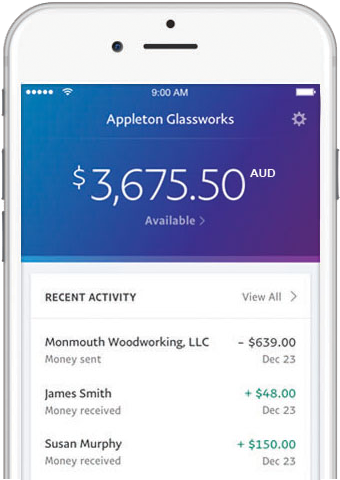 It’s just 2.6% + $0.30 per paid invoice from Australian customers (excluding payments from international cards) with no monthly fees, set-up fees or cancellation fees. Your customers receive your online invoice in their email inbox. It will include a payment button which, when clicked, launches a simple invoice payment form. Your customers can pay you from their PayPal account, or directly with their Mastercard, Visa or American Express card. We’re as mobile as you are. Send invoices straight from the PayPal Business app and say goodbye to the nightly paperwork. Invoices sent on your mobile appear in your PayPal account online so, no matter how you log in, you’re always on top of your business. More ways to issue invoices with PayPal. Send an invoice from wherever you do business. 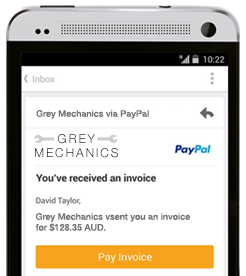 You can quickly and easily invoice customers from your mobile or tablet with PayPal Here. Create, customise and send invoices straight from your existing accounting software. Get paid instantly with PayPal, directly from your invoice. Send invoices quickly and easily with PayPal.